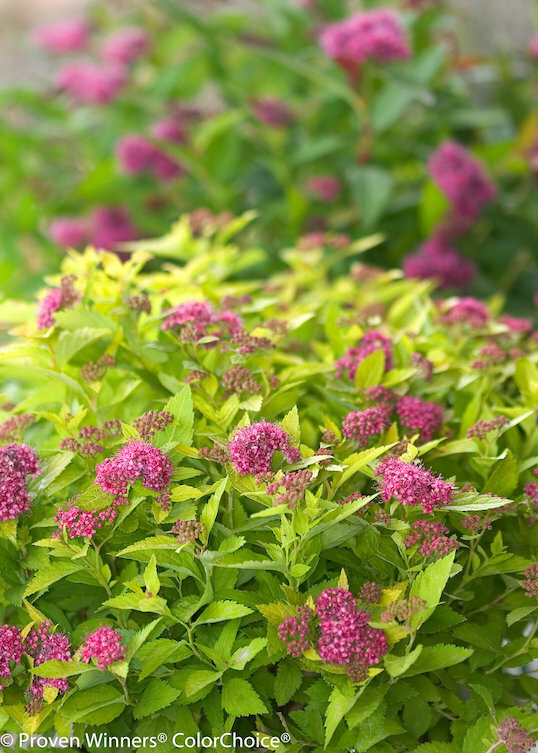 Learn about ways to use Chartreuse in the garden, along with plants that sport the color. 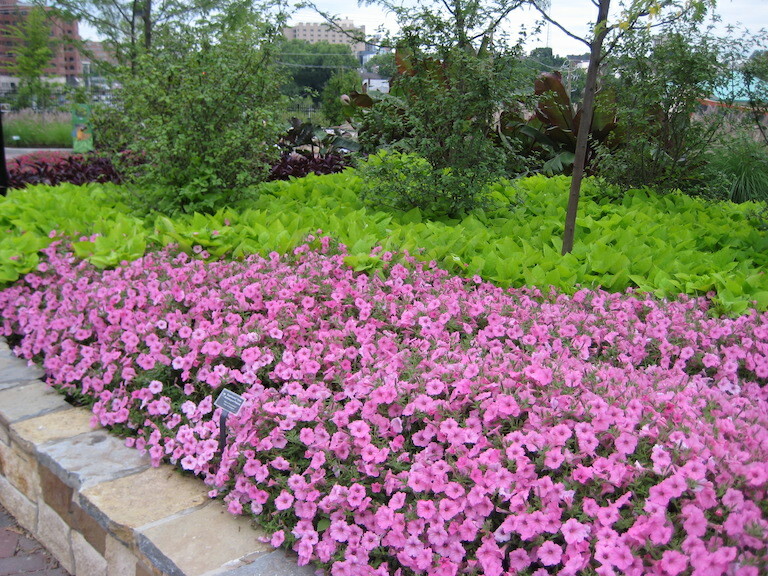 There are as many ways to use color in the garden as there are gardens. When designing a bed or container it is always good to think about the impact you want that bed to have. Are you looking for something soothing and calm, or are you looking for something bright and invigorating? Are you trying to make the space feel more open and spacious, or are you going for cozy and enclosed? 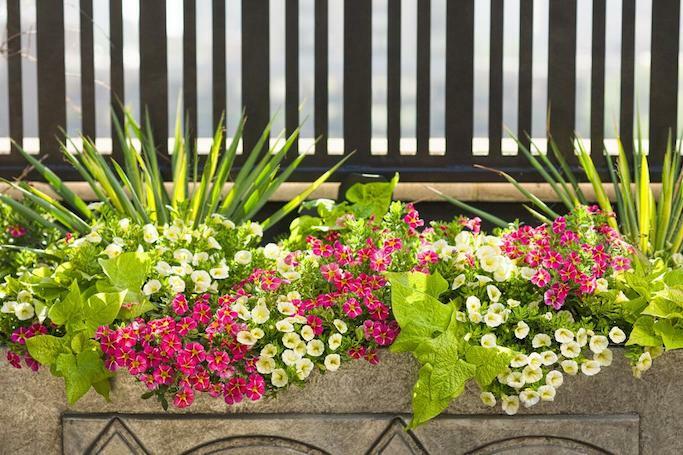 Are you looking to make something fade into the background - like your air conditioner or are you trying to draw attention - like the main entry for your home? Which colors you choose is one of the methods you can use to achieve your goal. 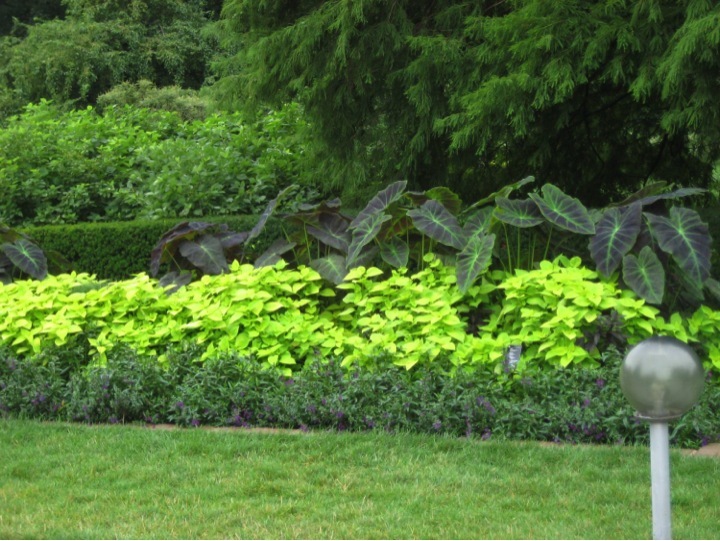 Let's take a look at chartreuse and talk about the effects this color has in the garden. 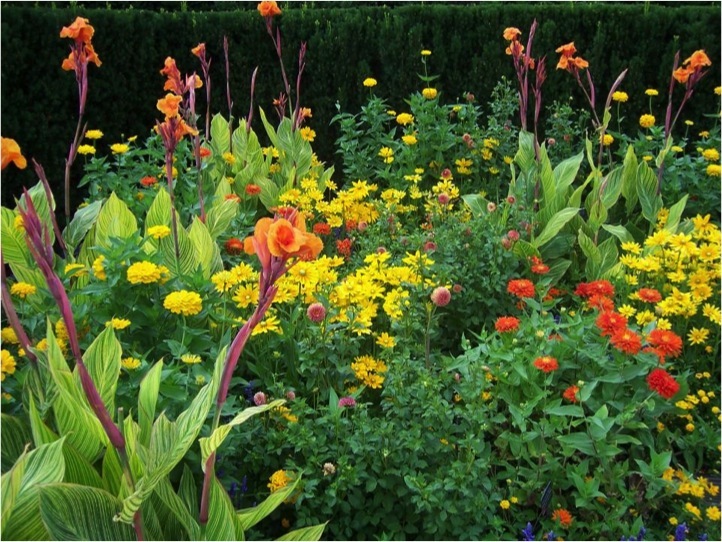 Green functions as a neutral in the garden and the yellow-green color often known as chartreuse is no different. 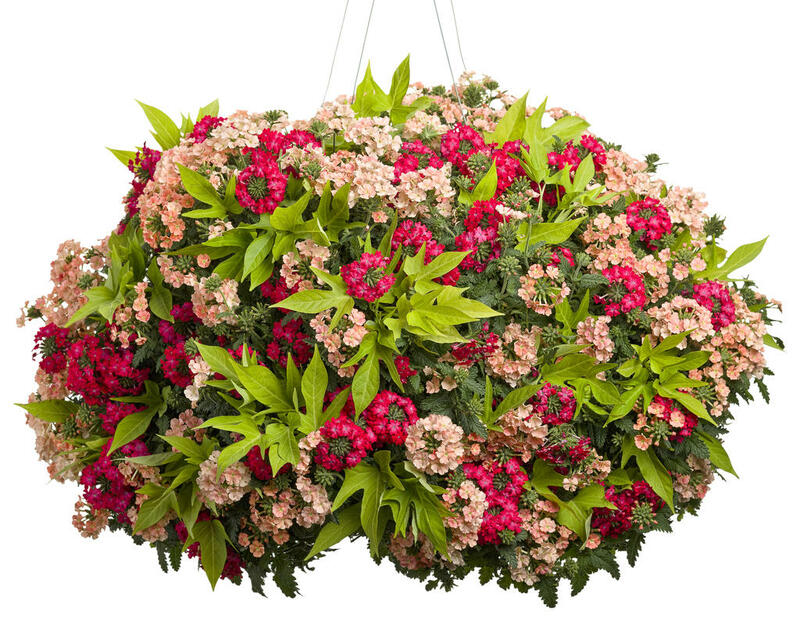 It is versatile and can be paired with virtually every other flower and foliage color you can find. 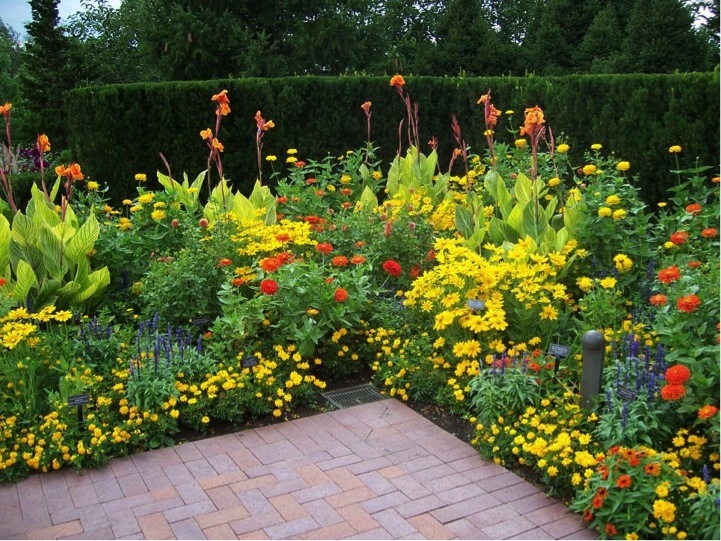 It is also quite bold and will enliven plantings. 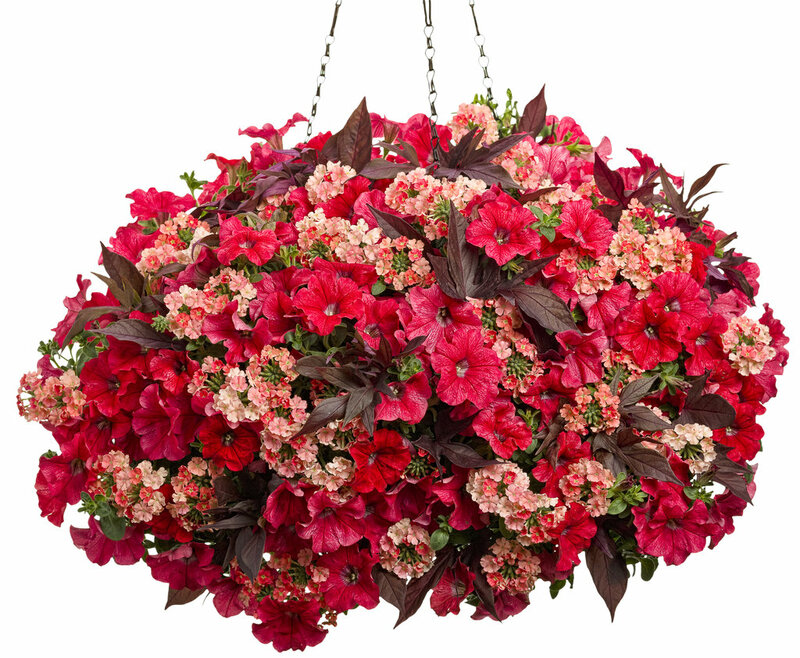 It is a bright color and will draw attention, as well as making smaller spaces feel more spacious. What a difference a plant makes. I think there is a tendency to believe that changing the look and feel of a space needs to mean drastic changes. 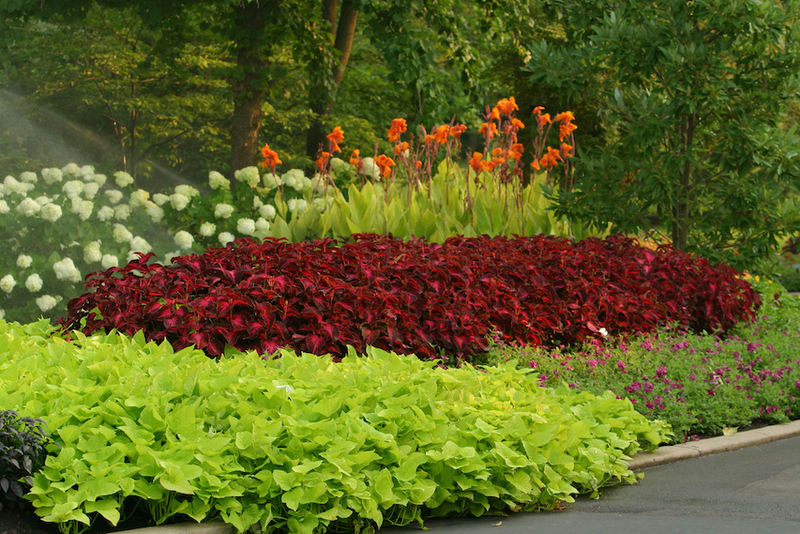 The reality is that swapping out a single plant can make a big difference. 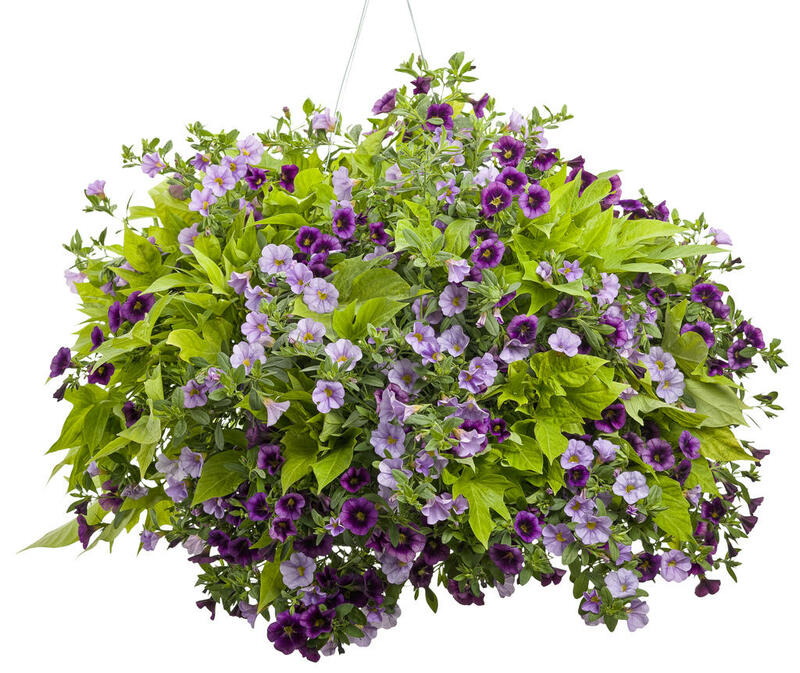 The two combinations below both have Superbells® Grape Punch and Superbells® Miss Lilac. 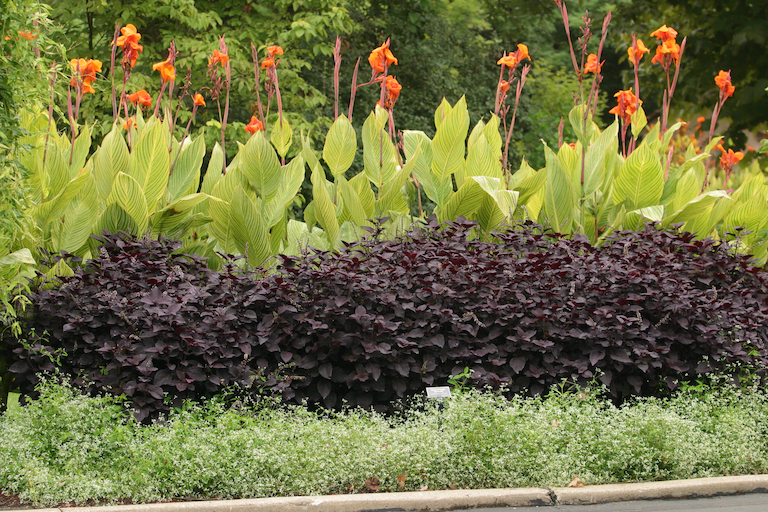 The only difference is that one has a dark colored sweet potato vine and the other has a chartreuse sweet potato vine. 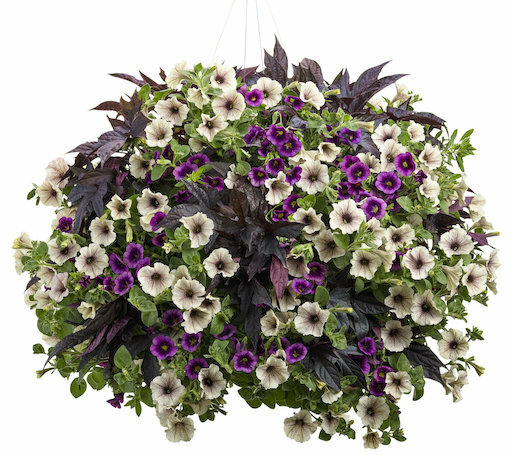 The planter with the dark colored sweet potato vine recedes on the page, while those with the chartreuse really jump out at you. The two examples below demonstrate the same thing. 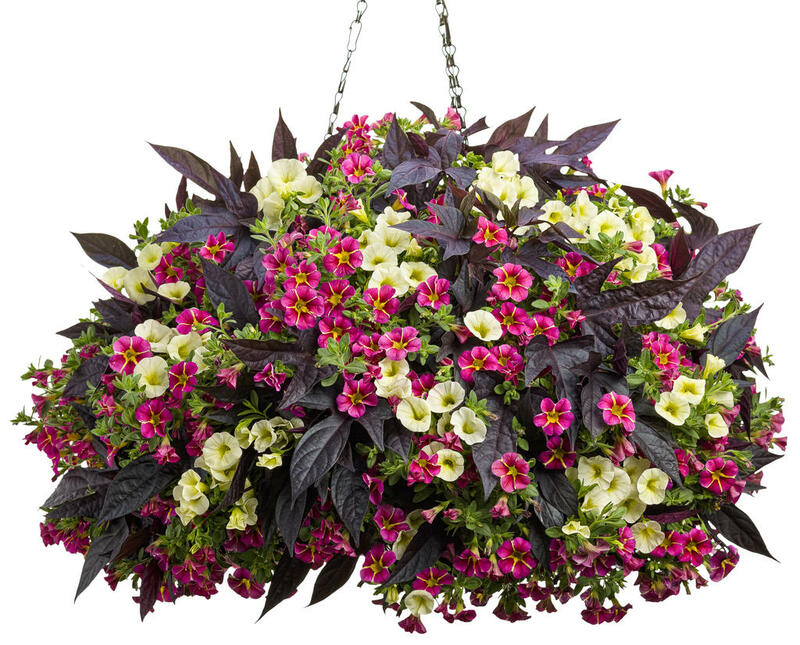 The two combos to the left both have Superbells™ Cherry Star and Superbells® Yellow Chiffon. The two combos to the right are a slightly different case. 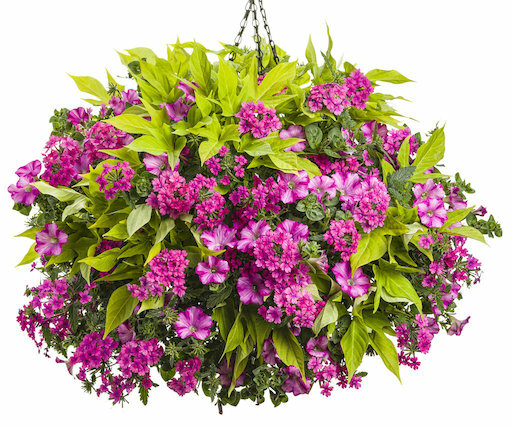 They both share Superbena® Royale Peachy Keen, but the one to the left gets its red color from Supertunia® Really Red, while the one on the right contains Superbena® Royale Iced Cherry. 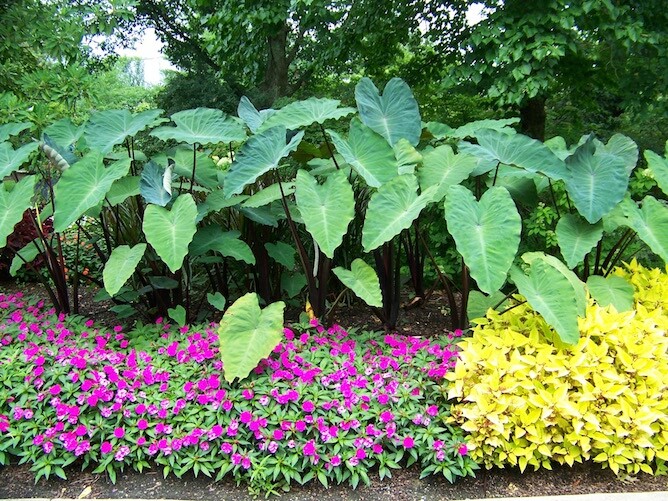 The one on the left has a dark colored sweet potato vine, the one on the right has a chartreuse version. By looking at these examples you should be starting to see how adding chartreuse to a combination can brighten a combo and add more contrast. 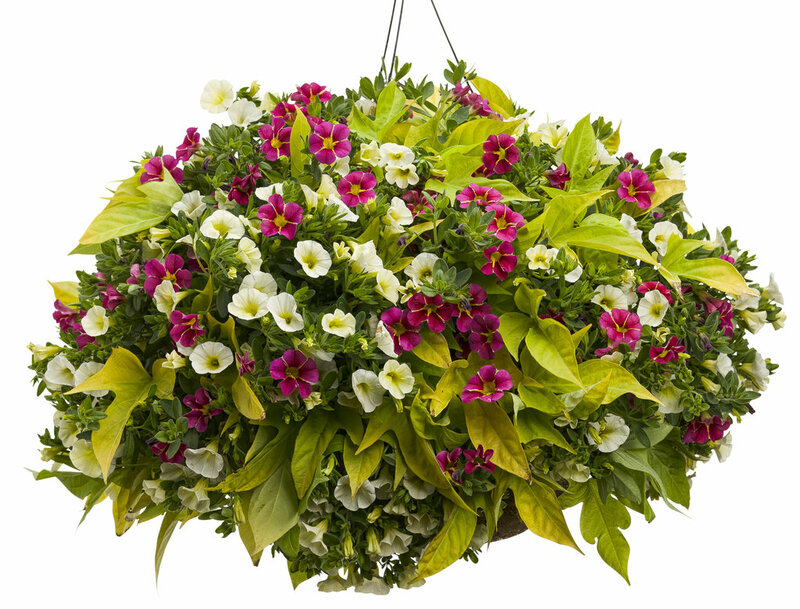 This works in landscapes, just as it does in containers. The photos are harder to come by, so I have one example. 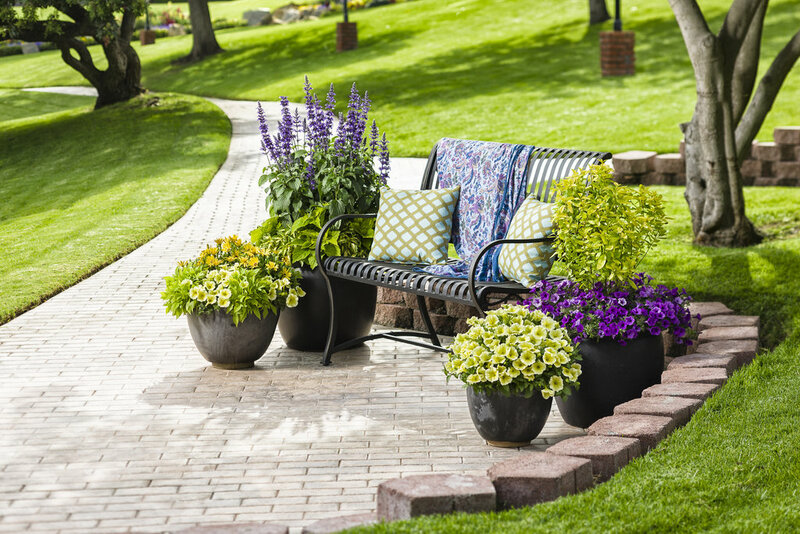 Because bright colors are eye-catching, they are a natural choice if you want to highlight something in your garden - a seating space, your front door or a piece of art, for instance. By utilizing bright colors, such as chartreuse, you can subtly draw your guests' eyes to important features. For instance, if you have two doors visible when guests arrive at your home. 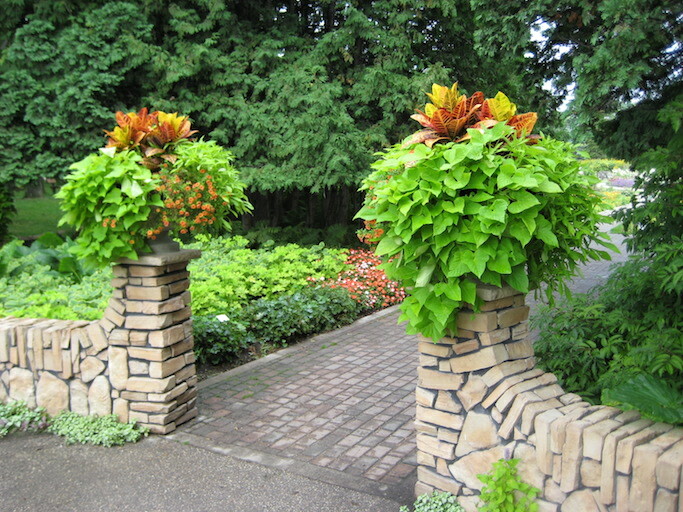 Brightly colored plants near one of the two can innately draw your guests to the preferred entry. 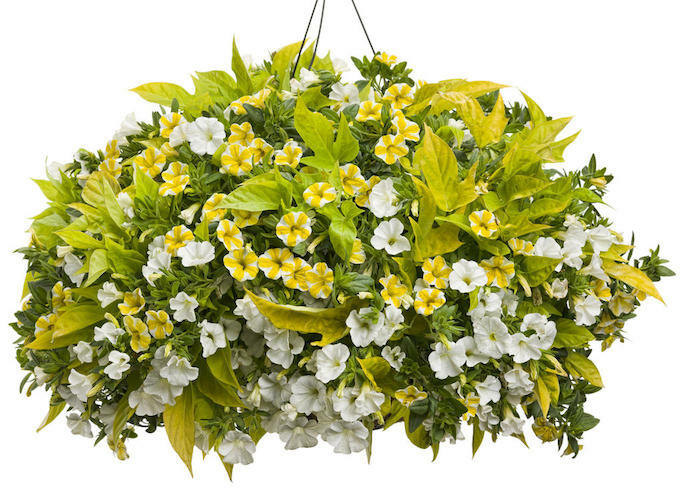 Since chartreuse is so good at adding brightness, it is a natural for shady spots that could use an infusion of light. 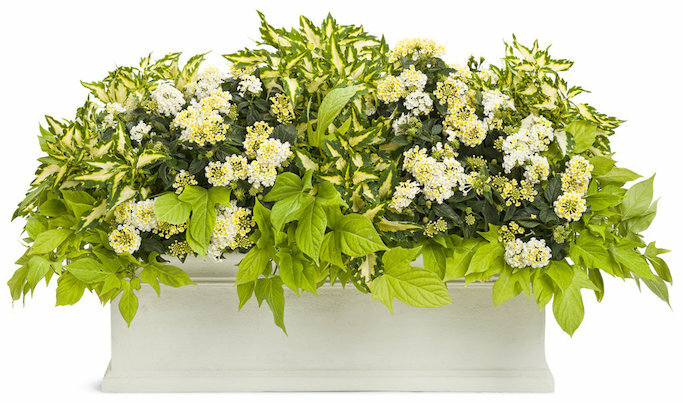 Chartreuse used with other bright colors like red, orange, yellow and gold will create a sunny, happy space or combination planter. 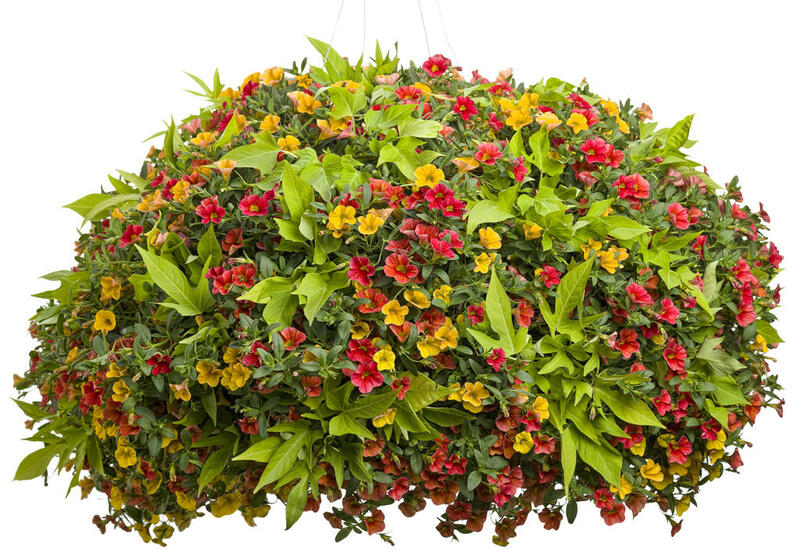 Warm colors such as these are wonderful to use in outdoor rooms where you host parties or the kids like to play. These color combinations put people in the mood to have a fun time. Chartreuse is excellent at creating contrast and drama. 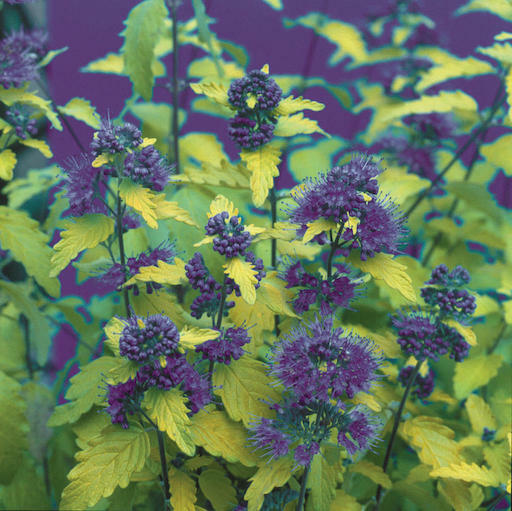 While ColorBlaze® Kingswood Torch is always eye-catching, but when it is combined with chartreuse, it has tons of drama. Knot Gardens are precisely laid out gardens and the chartreuse is what really defines the pattern in this version. 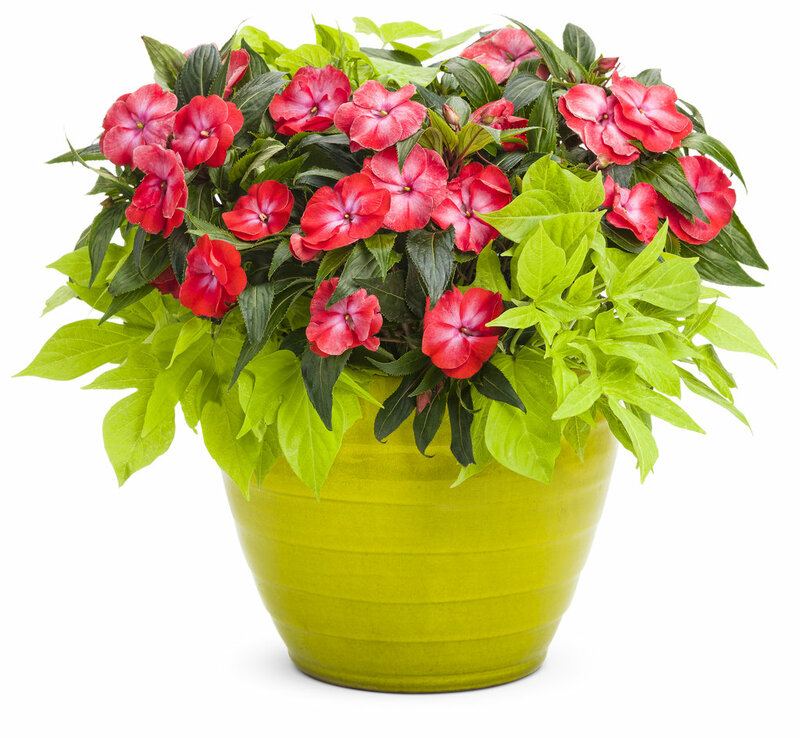 Supertunia® Vista Bubblegum® looks even better when chartreuse is used as a foil. 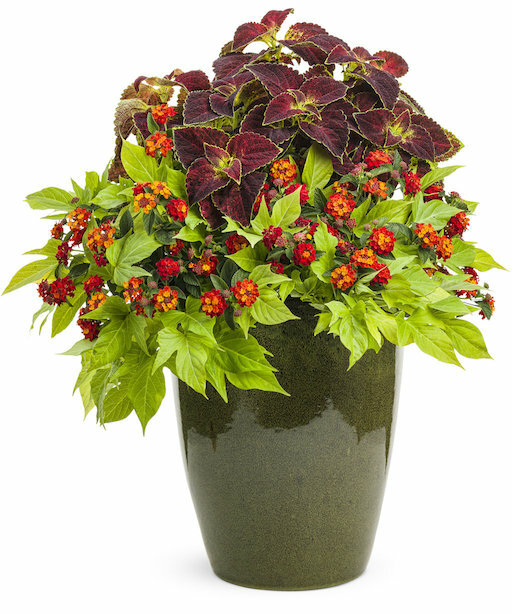 With highly contrasting foliage, flowers aren't even necessary for color and drama. Chartreuse works with every color of the rainbow. Here are a few examples of combinations of red and chartreuse. Now, a few that use purple and pink. Finally, a few that use mostly yellow along with the chartreuse. For more ideas, check out our Pinterest board. 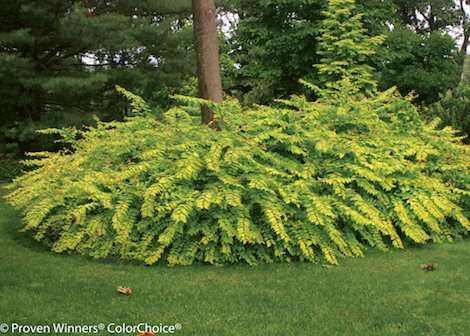 Chartreuse can be a great addition to any garden or combination. 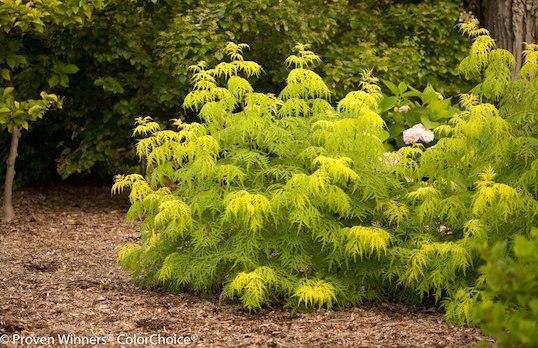 Here are some plants to consider, if you want to try the color chartreuse in your garden. Good afternoon, Kerry! I love your blog and notes, but now I have a question. 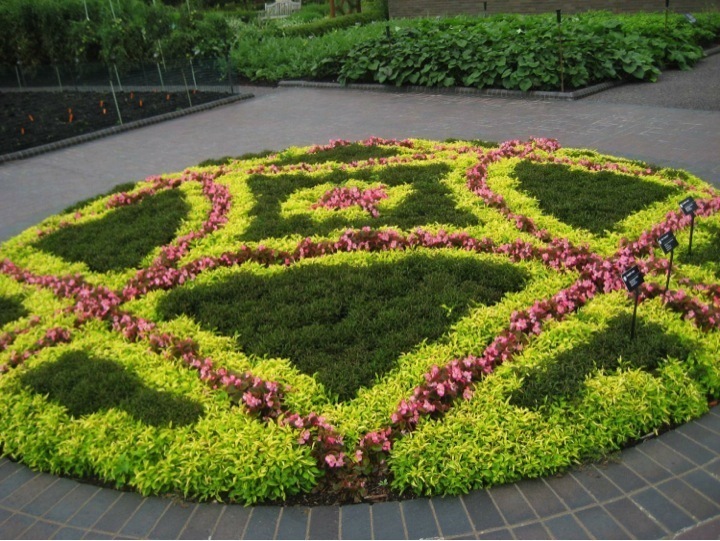 What is the name of the chartreuse edging plant in the image of the knot garden on this page? I see it everywhere and love it, but cannot figure out what it is or where to buy it. Many thanks! 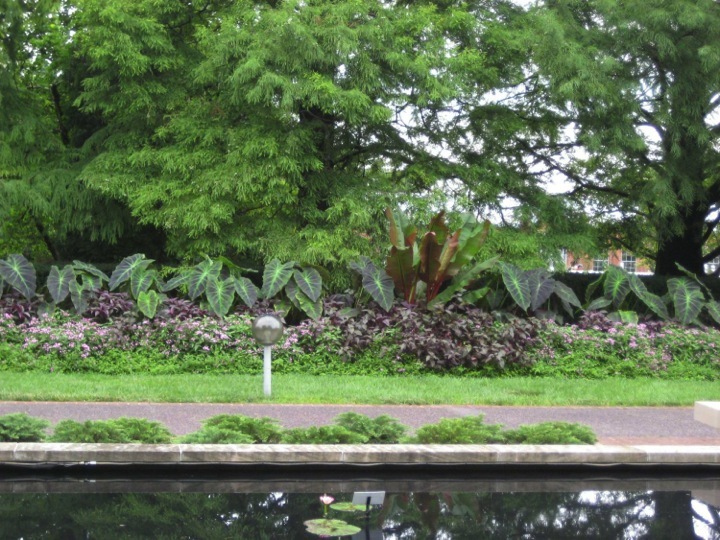 I took that photo over a decade ago at the Missouri Botanic Garden and no longer remember what is was and I can't get a close enough look to recognize it. I'm guessing it might be salvia Icterina, but that doesn't seem quite right either. Lemon Coral Sedum, would give you the color, but be a different texture and would spread more than what you see in the knot garden. 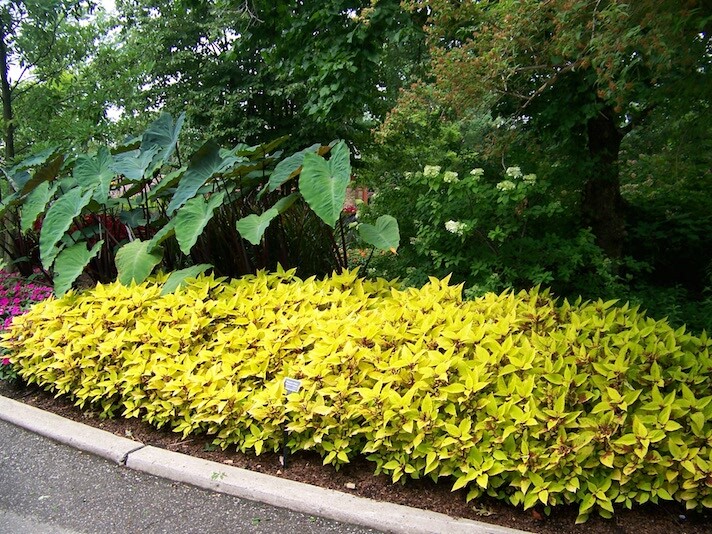 It is a great option for a well-behaved chartreuse plant in landscapes or containers. I love all the pictures you used as examples this time. 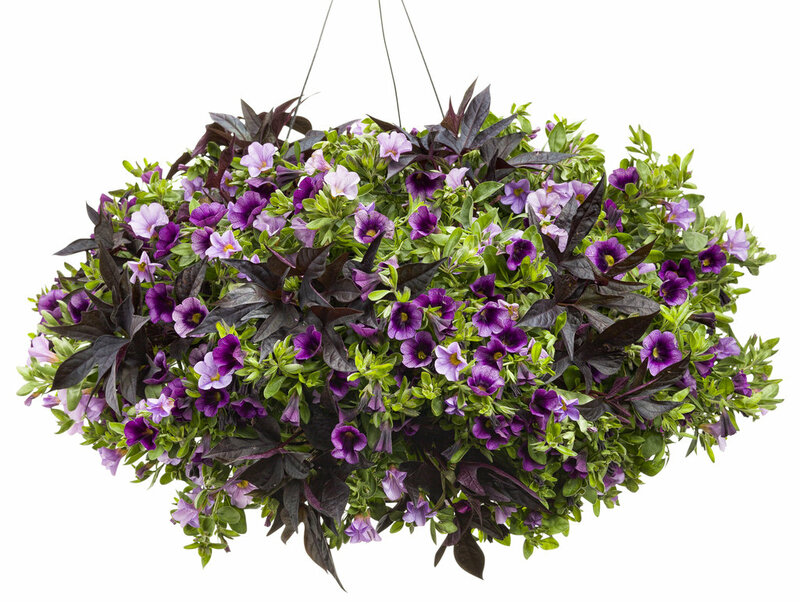 Usually I don't care for the green sweet potato vine, it is very common and I try to have other trailers in my containers but yours look spectacular. I really enjoy your column, keep them coming. Bonnie Frain in Stillwater Minnesota. Thanks, Bonnie hearing that someone enjoys our plants always makes me happy. 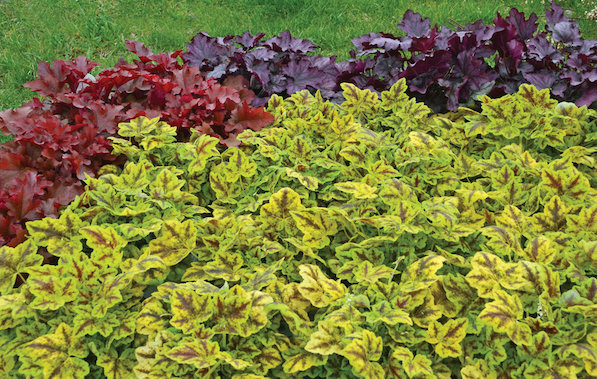 If you want chartreuse but not Sweet Potato Vines, Lemon Coral Sedum would be one plant to consider. 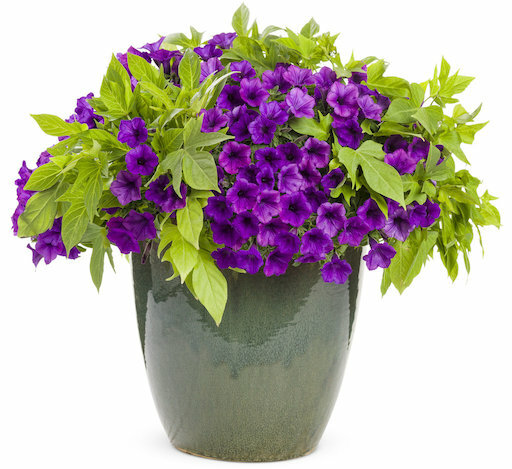 It is considerably smaller than a Sweet Potato Vine, but it is a tough as nails annual. I did not choose, but I did choose white, and I also use a lot of blue. White is another great way to act as a contrast to other colors and to pull attention. 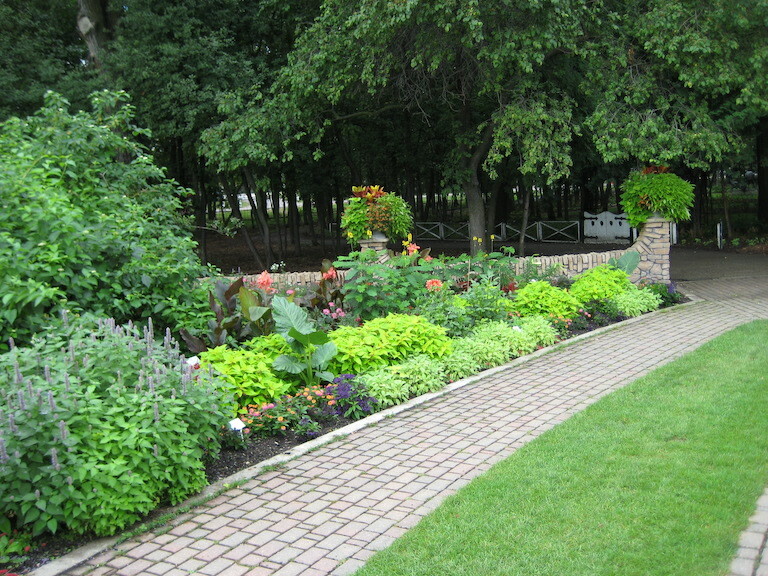 In the fall of 2013, I started a new flower bed. All lime green and hot pink, it's been easier to fill up than I thought! it started with a "Limelight" hydrangea, 2 " Little Lime" hydrangeas, and 2 "Double play" spiraea, I've added some dianthus, a clematis, phlox and some coneflowers. It has a stacked rock border, birdbath, small trellis for the clematis and wind chimes. It's gotten off to a nice start this spring. I'll see what gets added this year! It sounds gorgeous! I love it. Loved the entire chartreuse article. The photos really helped emphasize the dramatic difference that that color can make. 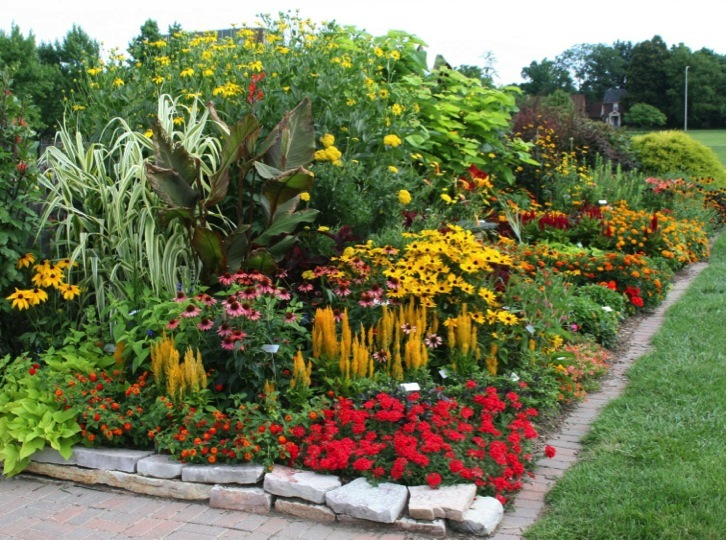 I volunteer in my development to do the gardening and I was resetting my plans as I read the article. I live I PA mountains & the article is helping to cure my cabin fever. two planters. With this "wow" article and photos I will use much more. 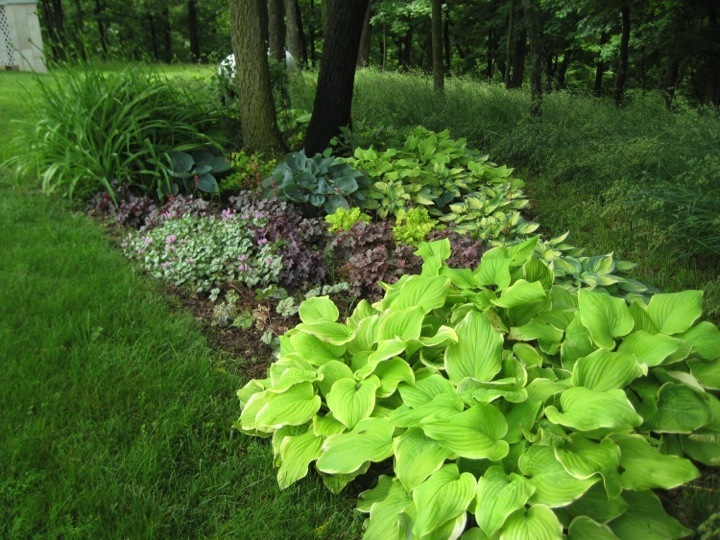 Love the idea of your series following the colors of plantings. Best wishes! Stay warm! Stay well! I'm glad you enjoyed the article, it was fun to write. I thought the photos did a pretty good job of conveying the information I was trying to give. It is great to know that you found the information helpful. Thank you for taking the time to drop me a note. I appreciate the feedback and input.